In the era of Donald Trump and #TheResistance, questions of free speech have once again come to the forefront of public consciousness. Should Megyn Kelly interview Alex Jones, who believed (or believes) the Sandy Hook shootings were a hoax? Should UC Berkeley host alt-right and alleged pedophilia defender Milo Yiannopoulos? Should society respect neo-Nazis and white nationalists’ right to peaceably assemble and promote their view online? Undoubtedly these are controversial subjects, and sometimes they elicit violent reactions from those who find the beliefs and actions of certain individuals objectionable. But this is not the first time that Americans have struggled over the proper boundaries of free speech. Much of the drama has played out at the highest level, the United States Supreme Court. There have been many landmark court decisions regarding the First Amendment over the years. One of them, R.A.V. v. City of St. Paul, was decided 25 years ago today. The court unanimously struck down a lower court’s ruling in which a Minnesota teenager (referred to as “R.A.V.”) was convicted of violating a city ordinance forbidding the display of burning crosses or Nazi swastikas. The teenager had burned a cross on the lawn of an African-American family. Justice Scalia’s argument suggests that St. Paul could, for example, use the legal prohibitions against trespassing or arson to prosecute the wayward teen, but not the fact that he displayed a symbol of vile instincts and historical sins. Legal scholars have long recognized that the First Amendment is not a sanction for total and complete freedom of speech. Screaming “fire!” in a crowded theater when there is no fire will not be viewed favorably by most courtrooms. Libel and privacy laws are still very much in effect, as online news site Gawker learned the hard way. And leaking classified information, even if it exposes wrongdoing, is prosecutable. Just ask Edward Snowden. On the other hand, the court has rendered many controversial decisions removing proscriptions on speech that most decent, moral people would find unconscionable. Many Americans believe burning the US flag is as extreme as burning a cross, and most states outlawed the practice until the Supreme Court overturned these prohibitions in 1989’s Texas v. Johnson. Perhaps most controversial in recent times was the landmark 2010 Citizens United v. FEC, where, in a 5-4 decision, the court opened the floodgates for corporations and Super-PACs to spend limitless amounts of money (i.e., “speech”) on political expenditures such as advertising. The court, like all human judgment, has not been without error. It has been tasked with walking a difficult tightrope, preserving the cherished ideal of freedom, while simultaneously ensuring that it does not encroach upon other equally valued constitutional principles like equality and justice. 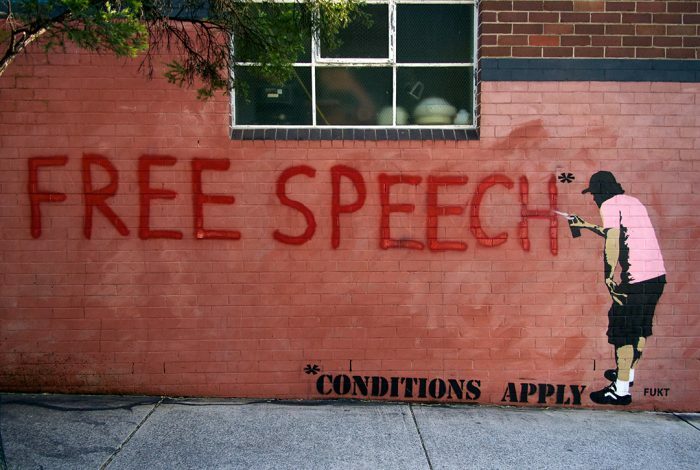 Here are several videos that give us an overview of the limitations of free speech, as well as a glimpse of some of the controversies we still face today. Related front page panorama photo credit: Adapted by WhoWhatWhy from cross burning (Confederate till Death / Wikimedia – CC BY-SA 3.0).